I usually don't do too many cutesy cards, but these two stamp sets from Clearly Besotted were just too adorable. They are I've got your back and Cheeky monkey. I made up a half dozen cards to send to my friends that I have missed meeting up with during my last visit to California. I think they are silly and unexpected cards, and should bring smiles to their faces. Hubs and I will be apart for our anniversary this year, so he surprised me with these today. He has been sending and bringing me flowers for the entirety of our relationship, more than 12 years now. The roses stay downstairs, it is cooler there. For my crafty space upstairs he brought me some beautiful big yellow daisies. I love that man, I am a lucky gal. Hubs and I spent the early part of May in Florida, for a seminar he attended. Not only did he get educational credits, but also a cold. You know how this ends, right...a week later I had it too. Fortunately I was only down 3-4 days. His stayed with him a good 10. My other distraction lately is our neighbor cat Cookie. She has run from me at every overture for the past 3 years. Suddenly this spring she decided we might be able to be friends. She is a sweet little calico that was a rescue. Our neighbors are well aware of her visits; she comes by several times a day and will stay for 10 to 30 minutes at a time. She particularly likes to visit my crafty space, it has so many things to explore. When she is tired, she'll sneak into the bedroom to take a nap. I am heading out to California to visit my Dad and cat sit for him while he visits family in Iowa. I will be gone for most of the month of June. I have pre made cards to post while I am gone, as my supplies will be limited while I am out there, and there will be lots of socializing to catch up on. I intended to join in on a challenge, but missed the deadline. I rather like the card and so I am posting it anyway. Copic coloring, which I will be practicing during my spare moments on the west coast, the stamp is from Technique Tuesday - Pansy. There is a bit of a glitter strip down the right side. It matches better IRL. Thanks so much for stopping by and I'll be popping in on you throughout the month to see what you are up to! Ya count me in on this week's Muse #166. Tracey had created a lovely card with florals and a gold embossed sentiment. I loved her design and used it as my jumping off point. I needed two thank you's and I decided to make another similar one. This card is going to a blogging friend. I am fairly sure she likes flowers -- because she makes gorgeous flower cards. Check out her blog here. I had piles of ink pads all over my desk in completing this card. The multi stamped flowers are often difficult for me to line up, but I have decided -- they don't need to be perfect! And, some actually are made NOT to line up perfectly. Happy Birthday Betty! I hope you have a fabulous day spent with those you enjoy and I hope the year to come provides you with fabulous adventures. On of the ladies I craft with on Tuesday, has a birthday today. Of course I had to make her a card. I stamped the sentiment on vellum and then fussy cut it out to layer it on top of the stamped images. Hello, to all you Moms, Pet Moms and Step-Moms I hope you are enjoying a wonderful Mother's Day filled with family and good times. This WPLUS9 stamp set is a favorite, even though my learning curve using it has been long and slow. 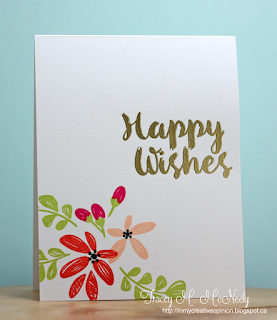 Last summer I finally used it nicely as a watercolored bloom, you can see that card here. I have been stymied using inks. Since my first few attempts I have added some more pink tones to my ink pad collection. I love the combination I ended up using. Hubs and I just returned from his work conference in Orlando. Hubs was away all day and had some evening meetings as well, so I had time to myself. I took no crafty stuff with me. I did spend time by the pool, got some reading done and napped. I napped every day, sometimes more than once. Naps are so much better when you are older than those enforced naps in kindergarten on a hard classroom floor. No wonder I didn't like napping as a child. I even stayed away from my electronic gadgets for the most part. It was a vacation. I had made cards ahead to post while I was gone, a few weeks ago. Then I was consumed with the packing and getting the house in order. I do not like to come home to a mess left by frantic packing. Tomorrow is soon enough to start on the laundry, so today I get to play. First up, Muse. 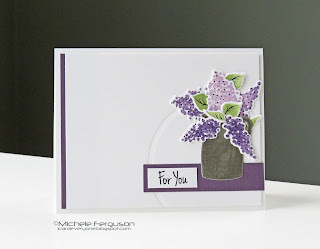 Michele has created a lovely flower card in purples and lavender. I went with her floral theme, the layers of shapes, and her color theme. Ah the masculine cards, I can make them for the Dad's and the hubs, but the nephews and the Godson...difficult. They range in ages from 15 to 26. To old for cutesy animals, and to young for nature cards. I am going take the easy way out and go with the numbers! Two of our nephews are just two years apart in age. They are brothers, with birthdays in the same week. The cards need to be similar in content so no one gets a better card. Hi, my last post showed the birthday card I made for Evelyn. Today's collection is a 6 pack of cards I made for her to have on hand. She is a card giver, and always seems to have something tucked away in her home for a spur of the moment gift. She is just amazing, kind, and I love her to pieces. I am so blessed to have and have had her friendship for 42 years! They are all relatively flat for easy mailing. Hi there. Today I have a card for my longest known friend...we first met when I moved to California when I was 13, we met in crafts class. Forty-three years later we are still the best of friends. We have that friendship that never feels the lapses of time, we talk on the phone weekly...more if something comes up that we just have to talk about. I can call her and say....I just have to say this out loud...spill it and then we hang up. She is my sister, but not the one you bicker with...the one who has your back and whose back you have. The one who is your biggest fan, and you are hers. She loves pink, so I do my best to incorporate it into her special card each year. And I have a second funny card for her, we never ever give each other just one card! So Dear Evelyn - Have a fabulous birthday! I am looking forward to time together on my next visit to California.